A day comes in every foal’s life when nursing must come to an end. 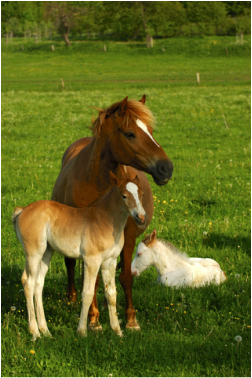 Separation from mom can be profoundly stressful for young horses. Chinese herbs can help smooth the transition into emotional and physical independence. Transition is not without its hardships. The measurable physiological effects of weaning have been widely studied. Various methods from cold turkey removal to gradual separation have been compared, studied and analyzed. Regardless of the weaning methods employed, many of the following symptoms are universally observed during the early days of separation between dam and foal. Elevated cortisol levels, lowered immunity, reduced weight gain and even disruption in bone growth and development have been documented by equine researchers. Elevated cortisol in the blood is an indicator of stress. Cortisol, a hormone produced in the adrenal glands which sit just above the kidneys, is related to the fight or flight response and is vital for self preservation and athletic performance. Cortisol becomes elevated during trauma, injury and during periods of stress. Prolonged periods of elevated cortisol can lower immunity, making foals vulnerable to infections. High cortisol is also associated with suppressed growth hormone and may account for the growth interruption and decreased canon bone development documented in studies during weaning. The good news is weaning stress is usually short lived, but its impact on the foal is truly dramatic and can take several weeks to fully recover. In TCM thinking, physical growth and development, bone development and the emotions of courage/fear are related to strong kidney qi. The body's kidney qi becomes stressed during periods of fear, illness, trauma and when the adrenal glands are working overtime producing cortisol. In TCM we pair the adrenal gland with the kidney because of their close physical proximity. From the TCM perspective, all organ systems of the body are related to an emotion and physiological function. It is a slightly different association than our Western classification system. The treatment goal is to support the weanling foal's kidney qi, reduce the stress and separation anxiety, recover normal growth, develop confidence and courage and adapt more quickly to life without mom. Ideal for supporting the weanling foal are the Chinese herbs Suan zao ren (Ziziphis jujuba mill) and Yuan zhi (Radix polygalae). Both herbs calm stressed anxious horses and nourish the Kidney qi. Suan zao ren is an adaptogenic herb. Adaptogenic herbs are unique in their ability to balance the endocrine hormones and the immune system, and they help the body to maintain optimal homeostasis and adapt to pressures and stressors both mental and physical. Yuan zhi, in addition to strengthening the Kidney qi and soothing the anxious horse, is known for its ability to engender confidence. Yuan zhi is great for youngsters finding their place in the herd pecking order. One teaspoon of powdered herbs mixed into the daily grain or a pelleted foal ration is usually adequate for the average weanling for two weeks.